Some foods have some nutritional benefits for healthy eyes and help for improving vision. A balanced diet that contains all kinds of leafy vegetables, fruits, fish and meat will give you all the important vitamins and minerals that are necessary to your eyes. Protect your eyes from the bad influence of the environment, rest them when you arrive and do not hold a lot at the computer, if you do not have to. On genetic factors, unfortunately, you can not influence, but you can provide what your eyes need from nutritionally valuable foods. Many foods have a beneficial impact on the health of the eyes. Adding vitamins A, C and E, zinc, lutein, beta-carotene and omega-3 fatty acids in the diet will have positive impact on your vision. Advice is to rely less on the vitamin in the form of various tablets and take them from fresh food as fruits and vegetables. Certain foods have a higher value when it comes to improving eyesight, so it is extremely important to include them in your daily diet to improve vision and have healthy eyes, preventing a variety of eye diseases. 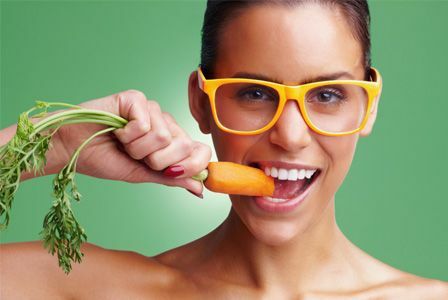 Carrots are first choice and number one for better vision is always carrots. You’ve probably already heard about its beneficial properties, but in short, its strength lies in the abundance of beta-carotene, lycopene and lutein. The first is good for the retina of the eye, protecting it from UV radiation. Lycopene acts as an antioxidant and protects the eyes from UVB rays. Lutein is a protective phytonutrient that has extremely strong antioxidant effect against free radicals. Green leafy vegetables are very good for healthy eyes and vision. Vegetables in this group contains plenty of nutrients like calcium, vitamins A, B12, C. Broccoli, spinach, lettuce and kale provide sight necessary minerals and vitamins and the level of antioxidants in them is very high. They protect the retina from UV radiation and prevent the degeneration of the eye. Regular consumption of green leafy vegetables can reduce problems with vision and cataracts. Quinoa-foods with low glycemic index reduce the risk of age-related macular degeneration by 8-10 percent. Whether what kind of eggs you prefer, they are important for good vision. Yolk has more nutrients. Eggs are a rich source of sulfur and cysteine, two components of the protein glutathione which keeps the lens from oxidative damage. Egg yolk contains lutein and essential fatty acids, zinc and B vitamins which have a positive effect on eyesight. This food is an excellent source of zinc, a mineral that is essential for eye health and vision. Zinc allows vitamin A to produce the pigment melanin that protects the eyes and which is associated with improved night vision. It is recommended 50 to 80 mg of zinc per day, and the amount you will find in six oysters is (approximately 77 mg zinc). Other foods that are rich in zinc are beef, peas and nuts. Salmon, tuna, sardines, cod and mackerel contain omega 3 fatty acids which favorably affect the health of the eye. Fish is an excellent source of EPA and DHA, two omega-3 fatty acids that are important for the health of the cells of the eye. Vitamin E and omega-3 fatty acids are essential components of peanuts. Vitamin E protects against proven cataracts and age-related macular degeneration, and people who have low levels of omega-3 fatty acids (DHA and EPA) are likely to have eye diseases such as diabetic retinopathy, damage to blood vessels of the retina that can cause blindness. They are rich in vitamin E, which is important for the prevention of cataracts. Other foods that are excellent sources of vitamin E are peanuts, kiwi and mango. Onion and garlic are rich in sulfur compounds that promote health lens and prevent glaucoma, cataracts and degenerative diseases. In addition, the arc improves the circulation of the eye and strengthens the immune system. Dangerous Diseases That Have No Symptoms!